Since I can remember, I’ve hated the Giants. Hate is a strong word, I know. I use it here in the ‘sports fan’ sense. To me, it carries a less aggressive meaning, less malicious meaning, than if you’re talking about an individual. Although some of my closest friends are Giants fans, the ones at Petco Park every year… generally bother me to my core. I don’t have anything against any individual on the team. I actually love their manager, Bochy…and Flannery, but I just can’t… and won’t… bring myself to cheer for them. Anybody born and raised a Southern California sports fan knows what I’m talking about. 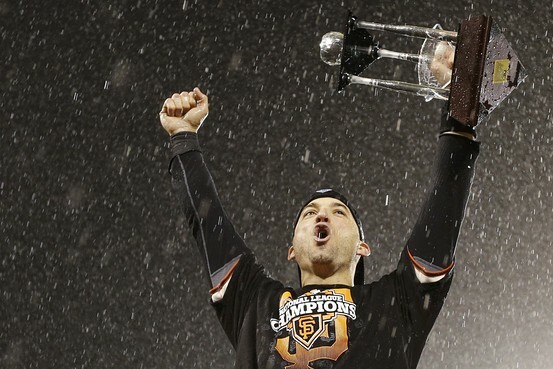 All that aside, there was something special that went on there in San Francisco last night. The stars aligned. I mean… that Hunter Pence hit… the shattered bat that literally hit the ball THREE TIMES? You cannot blame the rookie Cards SS, Pete Kozma, for reading that liner so poorly off the bat, because who’s ever seen a ball hit three times at once? That’s a microcosm of the Giants season. Things are just working. Balls are bouncing their way. Their hard work is paying off. It’s very, very impressive. Brian Wilson goes down… meh… Romo turns into a rock solid closer. Your best hitter does ‘roids and gets suspended…. so what… everybody else steps up. It’s crazy. They, for whatever reason, are destined for greatness. As hard as it might be to watch, for Padres and Dodgers fans alike… there is an element of hope in these Giants wins. How, you ask? It’s that feeling of “these guys aren’t any better than our team and they’re in the freaking World Series… again.” That brings hope for next year… hope for great things for your own team…that they’ll do what the Giants are doing. It can’t be the Giants year every year, right? The baseball gods don’t work that way. So, although I will be cheering for the Tigers… I will be happy for my friends that are Giants fans if they do pull off the seemingly impossible: beating Verlander and that fat Tigers lineup. But hey, if anybody can do it… it’s the team that just won a billion straight elimination games. This entry was posted in Baseball, MLB and tagged fat tigers lineup, Giants, giants world series, SF giants fan. Bookmark the permalink.